We offer some of the best Daytona Inshore fishing with light tackle and fly fishing found anywhere in the area! Reds, Snook, Trout, Shark and Tarpon- Yes! Daytona and its surrounding waters are known for the BIGGEST Snook and Redfish! These fish put up great fights on light tackle! Each year many Snook exceed 10 lbs or larger- which on average is bigger than many places around the WORLD! Redfish offer a thrill of a lifetime- the first run is long and hard, and each run after seemingly gets longer! These fish don’t give up! Redfish are not alone in these waters- How about catching a SHARK with a FLY rod can be breath taking! Have you heard of such a thing! It happens every day on the Daytona flats- see for yourself! Maybe you want to try for the “hat trick”- Snook, Redfish and Tarpon! 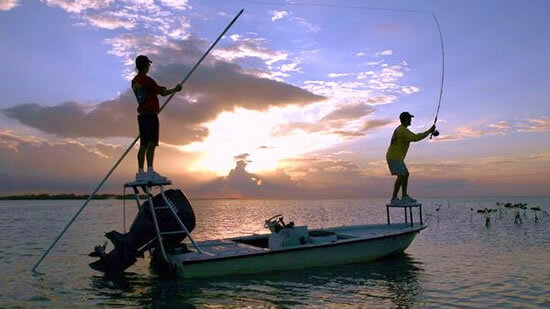 Whatever you catch – it will be an experience you will not forget! 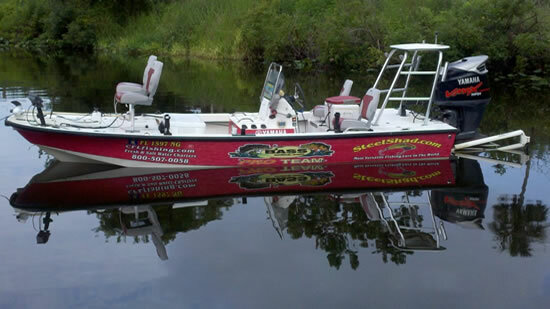 Call or email today to save your spot on the best Flats Fishing Daytona area has to offer! 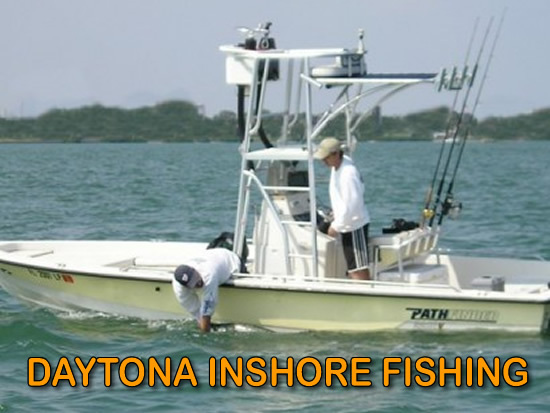 Call us today our just click “Book Now” below for your Daytona Inshore fishing Adventure! The inshore waters of Daytona has some of the best Redfish, Snook, Trout and Tarpon fishing found in the world. The average Redfish found in the Daytona area runs from 6 to 12 lbs., with plenty of quality Snook being caught every year. Snook are known best for their spectacular fight and drag runs. Can’t get off of work to go fishing? These trips are tailored to you! Trips can start after you get off of work in the afternoon or early morning as well. Daytona Inshore fishing at either night and early morning can be awesome. It’s true that Snook are nocturnal and do most of their feeding between dusk and dawn. If you have not tried this, put it on your bucket list. Good spots that are inundated with anglers during the day can be barren at night. Less boat traffic equals more fish willing to take a bait. Creek inlets and the surrounding area is one of my favorite areas for fishing. Give it a try you’ll love it! The prime season is Feb. – June. The Halifax River Trail (also known as the Halifax River Greenway) will one day stretch 11 miles from Port Orange to Ormond Beach on Florida’s northeast coast. It’s currently open in two short segments totaling less than 3 miles. The route is part of the East Coast Greenway, a growing trail network running from the Keys to Maine. In Holly Hill, a 1.3-mile section parallels Riverside Drive from LPGA Boulevard to 2nd Street. This stretch is also known locally as the Pat Northey Trail after a Volusia County commissioner who is an advocate for trails. At its northern end is Sunrise Park, set on a pretty peninsula dotted with palm trees and scrub oaks with a large fishing pier at the waterfront. With parking, picnic tables, and restrooms, the park provides a good starting point for your journey. About a half-mile south, the trail traverses Ross Point Park, which also offers a fishing pier and picnic benches along the river. In Daytona Beach, another 1.4-mile section continues southward to Riverfront Park. Note that there’s a short gap in the trail along Ballough Road. Mosquito Lagoon is located in the northern part of the Indian River Lagoon system and the Atlantic Intracoastal Waterway. It extends from Ponce de León Inlet in Volusia County, Florida, to the north end of Merritt Island, and connects to the Indian River via the Haulover Canal. The Lagoon divides the city of New Smyrna Beach. It also runs next to the Canaveral National Seashore on Cape Canaveral and the Merritt Island National Wildlife Refuge. The Kennedy Space Center is located on the lagoon as well. Mosquito Lagoon is an acclaimed red drum fishing habitat and a well-known destination for birdwatchers and nature tours. Winter, the bottlenose dolphin notable for her prosthetic tail (whose story was featured in the film Dolphin Tale was rescued from Mosquito Lagoon in December 2005. She plays herself again in the sequel, Dolphin Tale 2 to join with another dolphin named Hope. We cannot say enough about this place! Ponce de León Inlet lighthouse in 2011. Visited by over 80,000 people each year, the Ponce de Leon Inlet Light Station was designated a National Historic Landmark in 1998. The lighthouse tower and museum are located 12 miles (19 km) south of Daytona Beach and are open to the public year round. The Ponce Inlet Lighthouse is the tallest lighthouse in Florida and the second tallest lighthouse in the nation. Visitors who climb the 175-foot-tall (53 m) lighthouse tower are treated to a view of the Florida coastline and Halifax River from Daytona Beach to New Smyrna Beach. The lighthouse keepers’ dwellings and other historic light station buildings are now home to the lighthouse museum, with exhibits on lighthouse life, lighthouse and Fresnel lens restoration, the keepers and their families, Daytona Beach and Florida history, and shipwrecks. The Ayres Davies Lens Exhibit Building houses one of the finest collections of restored Fresnel lenses in the world, including the rotating first order Fresnel lens from the Cape Canaveral lighthouse and the restored original Ponce Inlet lighthouse first-order Fresnel lens. 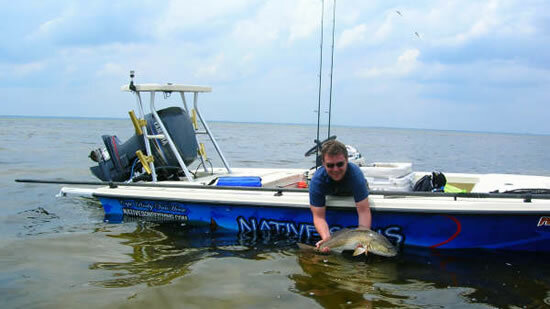 Redfish are one of the most popular sport fish on the flats. More has been written about Daytona Inshore Redfish fishing that almost any another light tackle species. 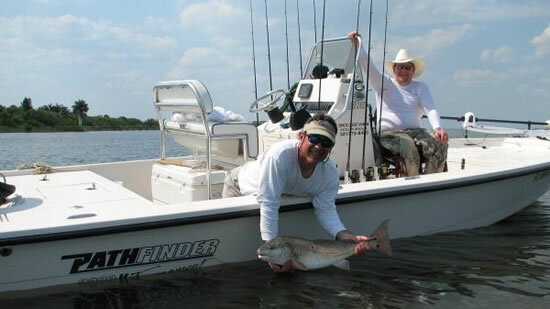 Sight fishing for Redfish is the most popular method using light tackle and/or fly. The Flats are home to the largest Redfish species in the world! Redfish are found on sand and grass flats on both the Ocean (Florida Straits) and Gulf (Florida Bay) sides of the Keys in water as shallow as a few inches. Redfish feed on small crustaceans like crabs and shrimp. For a thrill of a lifetime go Redfish fishing!! On all Daytona Inshore Fishing trips if not otherwise specified, our cancellation window is 48 hours or more prior to the charter for standard trips and 14 days or more for over six and yacht trips.